If, for some reason, Windows Explorer is not available as an application to open Zip files, you can use another archiver utility such as WinZip, WinRar, 7zip, etc. Files with the extension .sdlppx can be translated in Déjà Vu, with some preparation. This files are actually ZIP archives that contain several files. You can extract the files contained in the archive, translate the appropriate with Déjà Vu, and then put the translated files back in the archive. 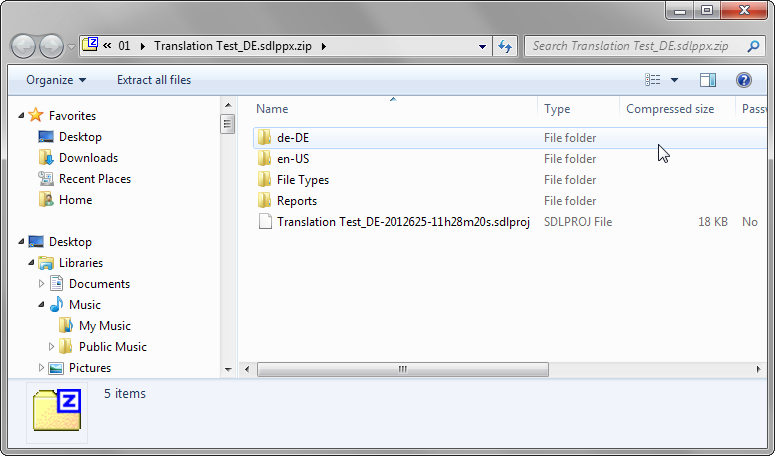 Make a copy of the .sdlppx file you want to translate. Rename the copy by adding the text .zip to the end of the file's name. Drag the .sdlxliff files from the archive to a different folder. Translate them using Déjà Vu. Once you have exported the translated files from Déjà Vu, drag them to the archive. You will be asked to confirm that you want to replace the .sdlxliff files already in the archive with the ones you just dragged. Accept this warning. This information is helpful regarding how to import the files for translation. However, SDLPPX packages often also contain translation memories and/or termbases. DVX3 does not directly support the TMs and TBs that come in an SDLPPX file. You must convert them first to a format DVX3 does support. Trados Studio, among others, should allow you to do this conversion. If I had Studio, I would not need to check how to deal with SDLPPX packages in DVX. I got as far as "I need to convert". The whole point is that the DVX Help doesn't give any information _how_.